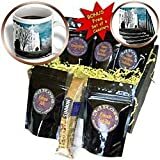 The St. George, Utah LDS Temple for the Church of Jesus Christ of Latter Day Saints in Cool Tones Coffee Gift Basket is great for any occasion. This elegantly presented gift box comes with a 15oz mug, a biscotti cookie, 5 blends of gourmet coffee and includes a BONUS set of 4 soft coasters. Coffee selection includes French Vanilla, Kenya AA, Decaf Colombian Supremo, Chocolate and Italian Roast Espresso, sure to please a variety of coffee coinsures. All packaged in our signature 9″ x 9″ x 4″ black box.